Syrian residents, fleeing violence elsewhere in Aleppo, arrive in the city’s Fardos neighborhood Tuesday. As the last rebel neighborhoods in Aleppo fell this week, Samantha Power, America’s ambassador to the United Nations, excoriated Russia, Syria, and Iran for authoring what will prove to be the signal atrocity of our time. 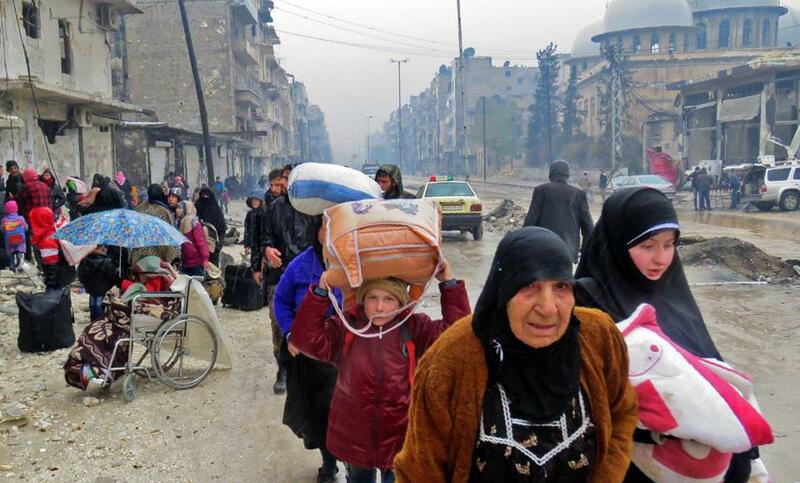 Hundreds of thousands chose to stay in what they proudly called “Free Aleppo,” eschewing safe routes when they still existed and vowing to preserve their alternative to Syrian President Bashar Assad even if it meant death. This week, that horrific choice materialized. Assad’s regime destroyed rebel Aleppo step by step, using Russian airpower; legions of militiamen from Afghanistan, Iraq, Yemen and Lebanon; and the barrel bomb, another of the war’s sad innovations. Syrian rebels in Aleppo had warned for a year and a half that a siege was inevitable unless their backers, including the United States, provided them at least with air support and a steady supply of bullets and cash. Western officials decried the unfolding tragedy in Aleppo, but their actions guaranteed this week’s genocidal denouement. The United States withheld basic support to vetted rebels. Turkey diverted its proxies to deal with the Kurdish problem on the border. And the West continued to negotiate after Russia engaged in blatant subterfuge and spectacular war crimes, emboldening the scorched earth campaign in Aleppo. Ambassador Power is right to ask about shame. Ultimately, a great share of it will belong to her government and the other fair-weather “friends of Syria” who supported the country’s revolution only half-heartedly — enough to prolong it while also sealing its failure. For a quarter-century, since the collapse of the Soviet Union, the international order trended toward more accountability and cooperation. Sure, international law is most often honored in the breach, and institutions like the International Criminal Court have no enforcement arm. But for a time, the international community was a meaningful forum with a conscience, and it created new doctrines like the “responsibility to protect,” which held that any state that wantonly murders its citizens forsakes its sovereignty. New norms took root: War crimes still occurred but invited wider and wider condemnation, military interventions required legal justification, and humanitarian concerns achieved the status of core national interests. Altruism and self-interest were crucially intertwined in doctrines that aimed to make the world a less cruel but also a more stable place. We opposed torture and war crimes elsewhere because they’re dead wrong, but also because we don’t want out own citizens subjected to them. Today, an opposite calculus is in effect. We don’t stand against the leveling of Aleppo because we reserve the right not to be judged for similar crimes. It will be difficult for America to invoke human rights as a cornerstone of foreign policy. 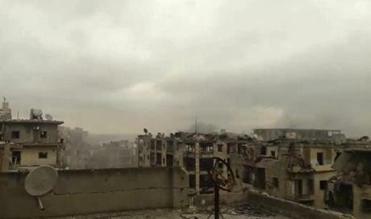 On a human level, Aleppo’s fall is nearly unbearable. Citizens, volunteer doctors, children, and others are hunted from neighborhood to neighborhood in the city’s shrinking Assad-free patch. Shells and bombs fall indiscriminately. Those who flee risk massacre by pro-government militias. If they make it to safety, they face torture or even death in Assad’s gulag. We can hear their pride and desperation in videos, tweets, and phone calls, often broadcast live as the battle for Aleppo climaxes. Many of us knew the end was coming, but when it finally did this week, it was a sucker punch to the gut. Even if we expected it, we hoped Aleppo would not finish this way. While this personalized violence is horrifying, it is hardly unique to Aleppo. Yet this apex of expedient, Machiavellian criminality caps off a long period when norms have eroded and international law has been undermined by its most important sponsors. Everyone has a stake in the erasure of Aleppo — not just the trigger-pulling governments in Damascus, Tehran, and Moscow. Aleppo has thrived for millennia and one day will recover as a city. The prognosis is not as good for the ideas we have cherished since World War II and which we hoped would prevent any repeats. Syria’s war will continue for some time — probably years. But barring a major and unexpected global shift, its outcome is no longer in doubt. Assad’s government will stay in power, slowly re-extending its reach over the entire territory of Syria and cobbling together some new version of the terror-and-torture apparatus through which it coerced the compliance of its population until 2011. We watched the block-by-block incineration of a free city. Its rubble will build the foundation of our century’s pessimistic new world order. Thanassis Cambanis, a fellow at The Century Foundation, is the author of “Once Upon a Revolution: An Egyptian Story.” He is a columnist for the Globe Ideas section and blogs at thanassiscambanis.com.